When redbuds are mentioned, many people may bring to their minds a place - Hong Kong. Hong Kong situates in the eastern coastal area of China, to the east of the influx of Zhujiang River, and bordering with Shenzhen of Canton province in the north. Hong Kong includes Hong Kong Island, Jiulong and Xinjie, and has a total area of 1095 square kilometers. Hong Kong has been the territory of China since ancient time. It was occupied by Great Britain after the Opium War in 1840. According to the Consigned Statements published by China and Great Britain on December 19, 1984, the governments of the two countries held the hand-over ceremony on July 1, 1997 as scheduled. From then on, China restored its sovereignty over Hong Kong and realized the common wishes of the Chinese people to take Hong Kong back. In the history of Hong Kong, there is a solemn and stirring story about redbuds: on June 19, 1898, the �Special Treaty for Enlarging the Leased Land in Hong Kong�, which humiliated the nation and forfeited China�s sovereignty, was signed. The British government leased forcibly a large part of Jiulong Peninsula and more than 200 islands nearby (later on called Xinjie), and the leasing period was 99 years. Two months later, Great Britain held the taking-over ceremony in advance, turning a deaf ear to the strong protests and boycotts of the local Chinese people. Thousands of patriotic people raised a rebellion to protect their homeland. They attacked the British camps and made them suffer a heavy loss. The rebellion was crashed cruelly and more than 100,000 people lost their lands. After the event, the villagers constructed a huge tomb in Mount Guijiao and buried all the dead heroes in it. Afterwards, trees with red flowers grow out on Mount Guijiao, which the local people had never seen before. Years later, the flowers were in blossom every here and there on the mountain slopes, particularly on the Tomb-sweeping Day after the lunar New Year. They seemed to recall the martyrs, and the local people named it redbud. In 1965, redbud was elected as the city flower of Hong Kong. In ancient times, redbud flowers were used to describe affectionate feelings. It symbolized harmony between brothers and the prosperity of the family causes. The story goes: in Nan Dynasty, the Chief of the capital city, Tian Zhen, was going to break up the family and live apart with his two brothers, Tian Qing and Tian Guang; when all the properties of the family were divided, they found that there was still a redbud tree in their yard. The tree was quite flourishing and full of flowers. During the night, the three brothers talked over to cut the tree into three sections, so that each one could have a section. On the next morning, when they went to cut the tree, they found that the redbud tree was all withered and the flowers all fell onto the ground. At such a scene, Tian Zhen sighed to his two brothers: �human beings are not as good as a tree�. Afterwards, the three brothers joined together again and lived harmoniously. The redbud tree seemed very intelligent and it reclaimed its vital force soon. Redbud has many other names. It is a mid-sized evergreen arbor tree. Its leaves take on all forms: round, egg-shaped or kidney-shaped; but the top part of the leaves all split into two pieces, just like the hooves of a sheep; therefore, it has its another name sheep-hoof flower. The blossom period of redbud is between the winter and the spring. 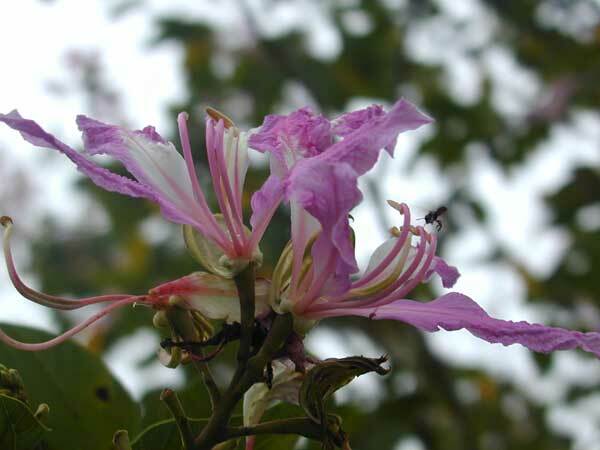 The flowers can grow as big as palms and give off a sweet smell. 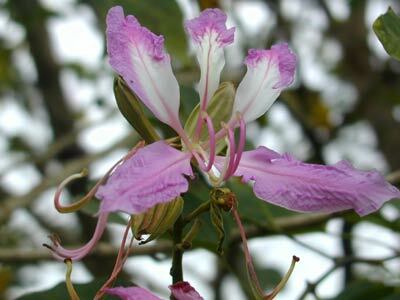 Its five leave pedals disposes evenly like a wheel; the flowers are red or pink and are extremely beautiful. Redbud trees are evergreen and are resistant to smokes and dusts; therefore, they are particularly suitable for planting on roadsides. The barks of the tree contain tannin, and can be used as dyes. Its roots, barks and flowers can also be used as medicines.